Purpose: to simulate how flexible fees stimulate the development of the circular economy. This will give you insights into how economy, ecology and sustainability overlap and what can be done practically and on policy level in this age of constraints. Why attend? Get ahead fast by learning through simulation to gain insights otherwise hard to access. Includes: Economic, practical and psychological perspectives – how clean-tech, fees and policy interact with perceptions. Should there not, many argue, be a market mechanism by which industrial emissions are curbed? Market -based instruments to encourage recycling and land restoration? Why are these mechanisms in their infancy? Should we not be learning more about these methods and developing them? Of course, but market mechanisms are emotional as well as logical – so we need a way to explore emission-curbing market mechanisms in the economic, practical and psychological dimensions. Simulation is a great way to get to understand these policy instruments up close, and to explore your own assumptions. 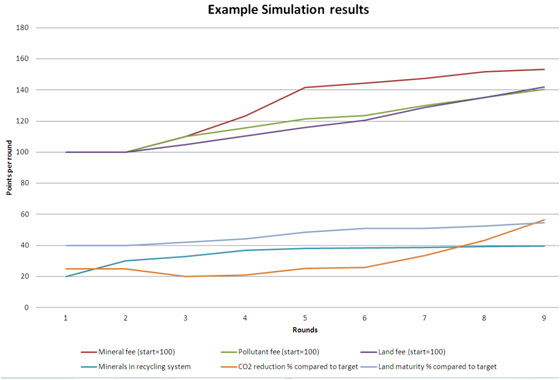 The picture above shows one of the graphs produced during the simulation as a result of the various choices made by participants. The object of the simulation is to use changes in fees ( along with persuasive communication) to influence purchase behaviour of other teams without stressing enterprises into bankruptcy. How does a market-set pollution price mechanism work? How to apply market-based instruments to eco-systems? How does WHAT we say when we change fees affect HOW purchasers behave? Under which conditions will a fees scheme stimulate investment in clean-tech? How would businesses react to a market – set price on emissions? Can emissions traders with large amounts of money and the intention to minimize emissions influence the clean-tech market? What are the conditions for a market which would stimulate rapid development towards zero emissions? How does investment in clean-tech affect economic growth and tax income? After introductory rounds of the simulation, participants are divided into interest groups, and the simulation is continued with adaptations based on the purpose for the session. Debriefing, and learning sessions are carried out between rounds to ensure participants get the maximum learning out of the experience. All participants are provided with a compendium for personal follow up and further reflection, including the scores from each round and accompanying graphs. Experience the world of market based instruments and fees for yourself! Locations: can be played out in a small group, in a fish-bowl setting with an audience or over online conferencing.